I have been postponing this upgrade to my house for years, finally searched for 3 quotes and one of them was with Dan. He came and provided me a fair quote, and fixed, the other companies quotes were: *starting at $xxxx*. The service was 10/10, there was an issue with the size of my garage door structure where the new door was to be installed, but Dan went above and beyond to deliver what he promised. I deal with many contractors every year (as a property manager as well) but Dan and Mario were easy and pleasant to deal with. Dan gave me a quote for a garage door replacement. He replaced everything door, track, springs. he is very professional, helpful and does the job right. I asked him to change the install date to accommodate my schedule and he did everything he could to get the garage door installed for me. I would gladly recommend him to anyone. Dan was quick to give me a quote that was reasonable and responded quickly to my questions. He was able to install the door and opener in a timely fashion. We are happy with the opener recommendation. It's super quiet! We would recommend Dan to anyone. Wow, what a great find! Dan was very professional and honest, did excellent work, quick to reply to communication and was willing to go the extra mile with his suppliers to check if my specific requests could be met. On top of that he had the best price! Specifically I wanted to have a 4 or 8 panel across door for my non-standard 15' wide door, which was not regularly available. 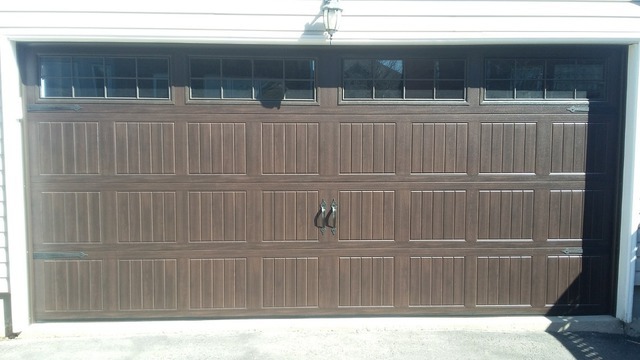 Definitely recommend Dan to all those looking for garage door work. Complete replacement of door, rails, opener and all controls. It was a real pleasure to meet you and your family, glad to here everything is well. This was a very smooth project from the beginning till the end. 2 garage doors were installed. Dan is knowledgeable and pleasant to deal with. He advised us on the design, and quite rightly advised against certain design we wanted to pick. Good we listened. He arrived as agreed, kept in touch, informed us about the order and installation date. He obtained the doors and installed them at the end of the same week. Quick, efficient job, and the doors work like magic. He even wired one of our garage door opener (that was unfinished by me), installed the safety, and fixed some anchoring for the opener. What else can you ask for? Thank you for your business Gabriel ! Dan is a professional to the core and very knowledgeable. Best quote and fastest response. Gave him a call on Tuesday afternoon and he showed up 7 AM next day to get the job done. My garage door spring had broken and I needed someone to repair it quickly. I contacted Medina and received a quick price quote over the telephone that was very reasonable. Dan came the next day as promised and showed up on time. Dan replaced the garage spring in less than 30 minutes and was very friendly, knowledgeable, and professional. I highly recommend Medina for any garage services.